Many people would be aware of the reasons behind WW2, but few people know what triggered off WW1. It started with Archduke Franz Ferdinand, the heir apparent to the Austria-Hungarian throne who was assassinated in June 1914. This set in motion a dangerous set of events culminating into WW1 or as it is sometimes referred to as the Great War. Lasting for four years, it cost the lives of over 13 million people and millions more injured. The brutality of the conflict is even harder to count. 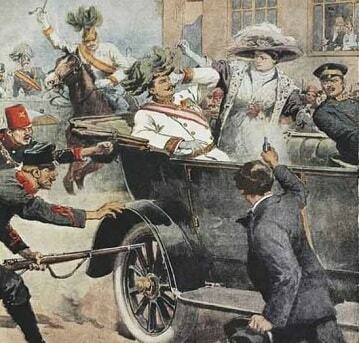 The assassination was perceived as a challenge to the Austrian rule over Serbia. Hence on 28th July Austria declared war on Serbia resulting in powerful allies taking sides between the two enemies. The Russians mobilised their forces in support of Serbia. In retaliation, the Germans backed Austria and declared war on Russia. In the world of political linkages, the Germans reacted by pre-emptively striking France who was allied with the Russians as a passage through neutral Belgium was refused to them. Thus Germany invaded Belgium and France. Refusing to withdraw from Belgium, Britain reacted by declaring war on the Germans on 4th August 1914. Thus the beginning of the Great War. The day after Britain declared war on 5th August 1914, the British establishment discussed strategy and how to mobilise its armies. The Secretary of State for India, Lord Crewe favoured using Indian resources for the war. The thinking was that since the British Empire must fight, it had to mobilise the Indian Army for overseas service. 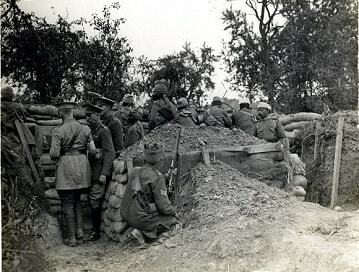 The authorities have declared that the British Expeditionary Force (BEF) which comprised of peacetime regulars of the Home Army would go to France to contain German onslaught. Surprisingly, even the Indian political leaders backed the British war effort in order to gain leverage over independence or at least dominion status. Even Mahatma Gandhi, the apostle of peace, supported the war effort till as late as 1918. He felt that India would not have the moral right to ask for greater political autonomy if it did not assist Britain in her hour of need. Indian regiments were soon dispatched to the ports of Karachi and Bombay. 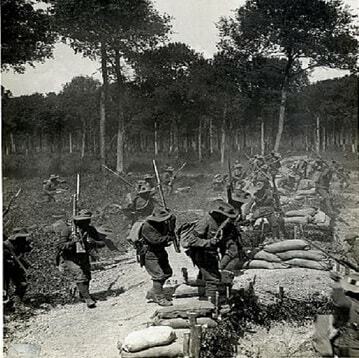 By the time the first Indian soldiers disembarked in Marseilles, France on 26th September 1914 and then another three weeks to get to the trenches, the BEF had already been stretched on the Western Front after two months of hard fighting, suffering heavy casualties. The regiments who came to France were to be part of the Indian Expeditionary Force ‘A’ (IEFA) which comprised of soldiers from South Asia as a whole. Whilst they may be fighting on behalf of the British, they were still treated as the second rate with inferior uniforms and armoury which was a generation behind what their counterparts in the British Army. There is a distinction between the British Army and the British Indian Army – the latter comprised of Indian soldiers commanded by British officers. 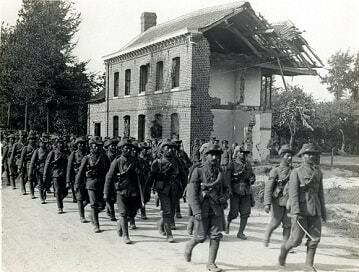 The Indian soldiers received a rapturous welcome from the French crowds. They shouted out from the streets Vivé les Hindous! Vivent les Alliés and showered them with flowers, chocolates and cigarettes. It was not just IEFA who was mobilised overseas. IEFB and IEFC travelled to British East Africa (now Kenya) to battle against German East Africa. It was actually IEFC troops from the men of 29th Punjabis who went into action in WW1 on 6th September 1914. In early November 1914, IEFD went to Mesopotamia after Turkey declared war. IEFE served in Egypt and Palestine and IEFG on the Gallipoli peninsula. During the war, Indian army units also served in Trans-caspia, Arabia, Greece, Salonika, China, West Africa and at home on the North-West Frontier. More than 1.4 million Indians served in the war which included combatants and non-combatants. Around 74,000 lost their lives. On the international stage, India gained independent representation at the Paris Peace Conference in 1919. As a signatory of the Treaty of Versailles, it gained automatic entry to the League of Nations. Domestically, it paved the way for numerous organizational reforms in the army, “Indianisation” of the army’s officer corps and the formation of the Indian Air Force. It also set in motion the chain of events that eventually led to Indian independence in August 1947.